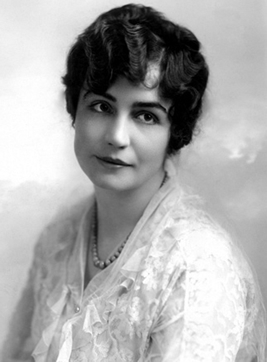 “Lois Weber, who kept that simple name all of her life, was born in Allegheny, Pennsylvania to a very religious family. Many of her relatives were preachers, and at a young age, she played the piano at church and sang in the choir. In 1897, she left home to take voice lessons in New York with the goal of becoming an opera singer. She toured with a singing group, where she met Wendell Phillips Smalley, the company stage manager. He was a descendant of Wendell Phillips, a human rights pioneer who had supported Lucy Stone and other suffragists, and it therefore is not surprising that Smalley encouraged Weber to keep her maiden name. His influence on her clearly was powerful, and she never returned to the religiosity of her roots. They married in 1904 and soon were involved with the pioneer motion picture industry. She first worked for the Gaumont Company, where she was fortunate to be mentored by the world’s first female director, Frenchwoman Alice Guy Blaché. In 1911, the couple moved on to the Rex division of Universal Pictures. As part of Universal, Weber managed all the roles basic to production: she directed, wrote stories and subtitles, designed sets, gathered props, and edited film. “The story of ‘Suspense’, a one-reel thriller, is a simple onea tramp threatens a mother and child, while the father races home to their rescuebut the techniques used to tell it are complex. Weber and Smalley employ a dizzying array of formal devices. The approach of an automobile is shown reflected in another car’s side-view mirror. We catch our first glimpse of the menacing burglar from the same angle as the wife doesfrom directly over him while he glares straight up. Three simultaneous actions are shown, not sequentially but as a triptych within one frame. Pointiert gesagt: ‘Suspense’ setzt bei den frühen Thrill-Effekten Porters an, bereichert sie um die cross-cutting-Methodik von Griffith und nimmt in einigen extravaganten Einstellungen die Phantasie Hitchcocks vorweg.